The Vegas Golden Knights are less than twenty-five games into their franchise history, yet they have taken the hockey world by storm, seemingly coming from nowhere. Thus far in the young season, the Knights have already achieved many special moments like their season-opening win after the Las Vegas tragedy or their recent win over the Los Angeles Kings. It leads to the question, just how good is this team, and where are the contributions coming from? The Knights have currently amassed a record of 12 wins, six regulations losses, and one overtime loss. That equates to a second place standing in the Western Conference’s Pacific Division, just a single point behind those same Kings. Not too shabby for a team comprised of mainly scraps. Even more amazing is the goalie play for Las Vegas. The team has managed to play five different goalies through the early stages of the season, a staggering number for a team with their rate of success thus far. Marc-Andre Fleury, Maxime Legace, Oscar Dansk, Malcolm Subban, and Dylan Ferguson have all minded the net at one point or another this season with varying amounts of success. Fleury came to the Knights after beginning a transition role to a backup for the Pittsburgh Penguins. He looked great as he started the year 3-1 with a .925 save percentage and 2.48 goals against average. Unfortunately for the 32-year old goaltender, he suffered a concussion on a play at the net and has yet to return to action for Las Vegas. Subban and Dansk have played a large role in keeping the Knights afloat since Fleury’s injury. Both netminders are just 23-years old, providing hope that they could provide a one-two punch for the next decade in Las Vegas. Dansk has been the best goaltender on the squad early with a 3-0 record, .946 save percentage, and 1.78 goals against average. 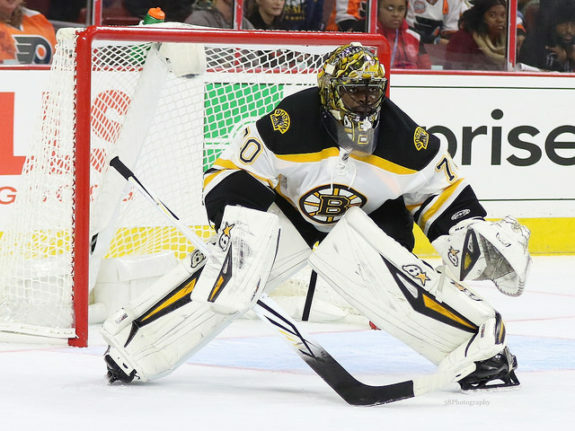 Subban has not been far behind, going 2-0 with a .936 save percentage and 2.06 goals against average. Subban has missed some time with an injury after he left with a lower-body injury Oct. 21 in the third period of an overtime victory over St. Louis. Good news came for the Knights when they activated Subban from injured reserve on Friday and assigned Ferguson was assigned to Kamloops. For as well as the other goaltenders have played, Legace has been the outlier. Through ten games, he has tallied a record of 4-5-1 with an ugly .872 save percentage and 3.67 goals against average. At just 24-years old, there’s still time for Legace to turn it around before being labeled a bust. The offense has also been producing at an exceptional rate, ranking in the top-10 of the league for several key categories like sixth in goal differential (plus-10) and fifth in goals for (68). Led by in points by David Perron (17), William Karlsson (16), and Reilly Smith (16), the Knights have had little trouble lighting up the scoreboard this season. James Neal has also been key for Vegas, scoring a team-high ten goals so far. “Our first two lines all season long have been playing well and creating a lot of scoring chances,” said head coach Gerard Gallant in a press conference Monday. Overall, this band of hockey misfits is using a balanced team approach in a sports world dominated by talk of All-Stars. Whether or not Las Vegas can keep up their stellar play remains to be seen, but all signs point to a bright future.